What do you think about what Walmart has done? In the next several weeks, we have Mother’s Day, Graduations all over the country and Father’s Day. Many people find it hard to express just how they feel through a gift. What do you get the person that raised you or that grad that worked so hard for 4 years to earn that coveted degree? You want to give them something that speaks from the heart but sometimes that is easier said than done. Walmart has made this dilemma much easier to solve with their new Empowering Women Together campaign. Now, you can go to the Walmart website and choose from hundreds of items that have been handmade from women all over the world. These unique items are made by women who are striving to live a better life for themselves as well as their families. Each item you purchase contributes to creating new jobs while greatly improving the lives of these women, their families and their community. This program is breathing life into people who otherwise would have had a very difficult life to look forward to. The program is part of the Walmart’s Global Women’s Economic 5-year commitment through 2016 to source $20 billion from women-owned businesses. The portal to these amazing products is called the Store For Good, so it is easy for you to find and gives gifts with meaning for those upcoming special days. 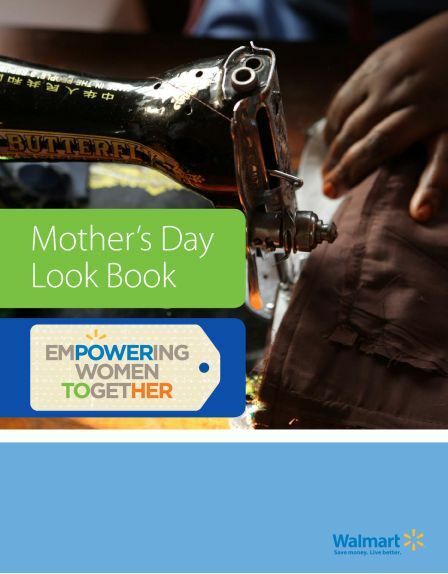 The items you can find through the Empowering Women Together campaign range from jewelry, home products, clothing and accessories, specialty food and much more. The countries who are participating include Haiti, Rwanda, Nepal and the US and Canada as well. Please take a look at this video Gahaya Links and Full Circle Exchange, which tells the story of two incredible sisters who turned a time honored tradition into a community wide renewal. I think once you see this video and you can connect with the real women whose lives are dramatically changing because of this program, you will want to spread the word! Right now, Walmart is running a Pinterest driven campaign and giveaway to drive traffic to their Pinterest board. I have been over to see the board and you will not believe the amazing pictures of the women and their products. It is truly uplifting and inspiring and it makes you feel connected to this campaign. Also, you will want to look at the Mother’s Day Glossi Lookbook which also shows incredibly beautiful and interesting photos of Mother’s Day gift ideas. In the spirit of celebration and gift giving, Walmart is offering a prize pack valued at $75 that includes several items from the Store For Good. To enter, you will visit the Walmart Pinterest board and pin an image to one of your Pinterest boards. Please include the hashtag #pintoempower as well as a short description about the woman featured in the comment section of the pin. Next just come back to my blog and leave the link to the pin in the comment section below this post. Good luck! I am being compensated by Walmart for participation in this campaign and I am part of the Mom It Forward Blogger Network. Next articleDo You Believe In Fairies? I had the same issue, said the picture was invalid. I pinned and used the same info that I was told to use when pinning it. http://pinterest.com/pin/86623992805328557/ Hope this is alright! I repinned it from Holly S. I tried to pin it from your site but it said no valid image. I also shared of facebook. Your pin link is not correct and this is the error that you get when pinning, Sorry! This is a not a valid image. I shared this giveaway through add this and I hope that is okay. Thanks for the awesome giveaway, fingers crossed! Would really love to win this,I could really use it!!! Thanks for giving us the opportunity to enter such a fun giveaway. Love this site. Good luck everyone. Didn’t win the Powerball, so maybe I can win a little something here. Sure would feel good! Nothing pinned to the board, it couldnt see any graphics. something is wrong with the twitter follow also. i have a twitter account, clicked on follow, and it still says i didn’t follow. when i tried to pin it as instructed, a pop up box came up with the message that “this is not a valid image” i don’t know how to get it to pin. Pin button was not working (image would not appear so I got an error message about an invalid pin), so I just repinned the exact same pin from someone else. Hope this counts! Thank you. I would love to win a prize from walmart, I shop there all the time, and I think it’s great that they are empowering women. Using the Pin button provided didn’t work… it told me that it was an invalid image? So I copied the text from it and pinned another picture. Hope that’s ok! We must empower women in third world countries. This is the link to my pinterest post comment. Entered as Patricia (B). Entered as librarypat, not Patricia B. What a good cause! Nice Vase! What is a pin? Since I am a quilter I have plenty of pins! That is a great cause, and it seems like a fun contest. I love that wallet pictured. So pretty. This is a wonderful cause. I love to see companies doing good things for others. What a great cause. Those vases are beautiful.